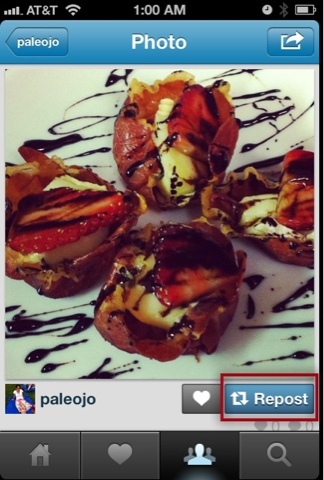 App Review: how do I repost a photo on Instagram? Well late last night I was asked "how do I repost something on Instagram?". My answer was you can't. As some of you may have noticed already you can't really repost by just tapping a button like on other social networks. The only way to repost from the app itself is to screen capture the photo, crop it and then upload it. The only problem with this is that you take the chance to offend the original poster since it looks like you're taking the credit for their photo. That's not the reputation you want to have online, remember hashtags and comments go alonnnnggggg way online. So is there a better way to repost on Instagram? I'll answer that with a common phrase that surfaced after the app store made it's appearance "there's an app for that". Actually there are several apps for this, but I'll just mention one in this post as I think it's the one with the most free options. It's called Repost for Instagram. 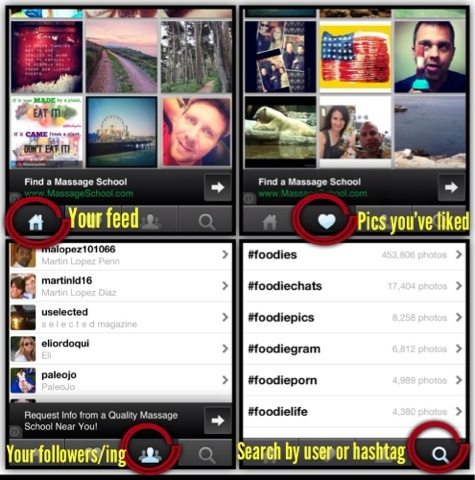 The free version has very similar features as Instagram with the exception of liking or following users. For those two features you'll have to purchase the Pro version for $0.99... Still not bad. The app is very intuitive and very similar to Instagram so if you're a user you shouldn't have any problems figuring it out. But just in case, here is a short recap to help you out. First of all as any app that integrates with a social network you'll be able to sign in using your existing credentials and you'll need to authorize the app in order for it to repost on your behalf. After that it's very simple. 1. 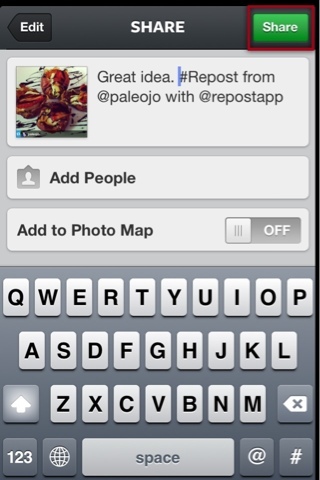 Use either the Home tab or search to find photos then tap on Repost. This will take you into Instagram where you can use any of the filters or features to enhance the photo. 2. Tap on Next when you're ready to continue. 3. Enter your photo caption and tap Share. Just remember at this point you're in Instagram so you can use the other features of the app as you usually do. Notice the app adds a hashtag, the original poster's Instagram name and the app name for credit. 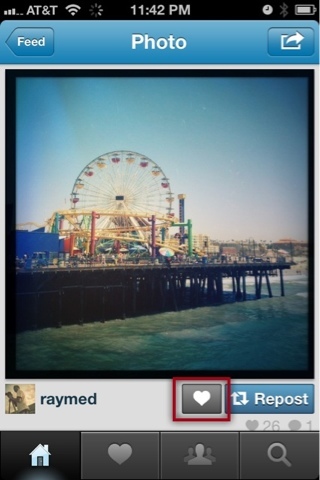 Instagram will then add the photo on your profile. As you see, the photo will show the Repost symbol at the bottom of the photo with the original poster's Instagram name. You'll only see this on the version of the photo on your profile. Not bad for a free app, it's pretty simple and works very well. Remember also that for $0.99 you can also like photos and start following users from within Repost for Instagram. 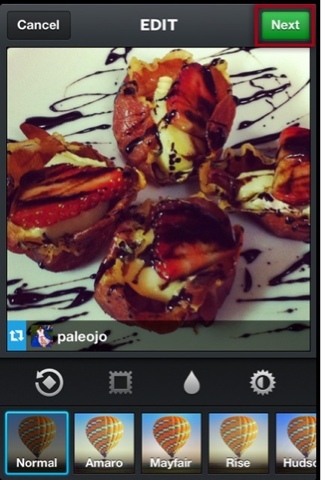 So yes, you can repost photos posted on Instagram just not within the Instagram app. Hopefully Instagram will add this feature later on, but in the meantime I think this is a pretty good option. 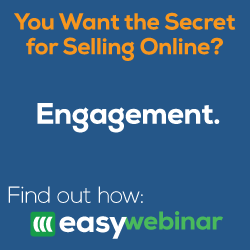 What else would you like to know about any app or social channel? Let me know in the comment section, who knows your question may generate my next post. 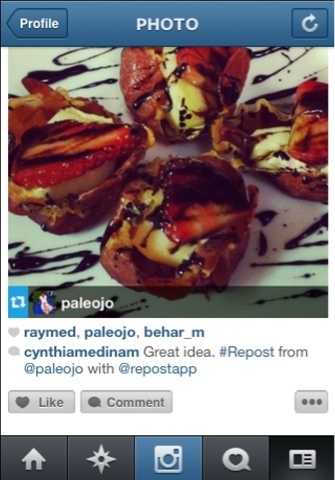 Thanks to @PaleoJo (paleojo.com) for asking this question and helping generate this post.